If you are selling dangerous goods or hazardous material on your WooCommerce store, you need a shipping carrier who will be able to handle it effectively. DHL offers a range of options to help you carry a range of approved products which are considered dangerous. However, you need to make sure that you are following all the necessary conditions and regulations to handle dangerous goods or hazardous materials. ELEX WooCommerce DHL Shipping Plugin helps you a lot in completely integrating DHL services on your WooCommerce store. In this article, we will discuss how you can ship dangerous goods/hazardous materials such as perfumes using the ELEX plugin on your WooCommerce store. DHL follows IATA regulations for air transport, and ADR for road transport. When you ship a dangerous product through DHL, you have to confirm beforehand which option you are using and create the shipment according to that. If you are not sure about the regulations related to the shipping of dangerous goods, it is advisable to contact the customer support team of DHL. DHL accepts dangerous goods for shipping based on the product type and service used. There might be specific restrictions related to a country or region. So, in this case too, it is best if you communicate with your local DHL office to understand the guidelines better. Dangerous goods can be shipped only by approved customers of DHL. You have to follow the guidelines for appropriate packing, marking and labeling of dangerous goods. All the necessary set of documents need to be submitted along with the shipment, such as store owner’s declaration of dangerous goods. In addition, the store owner needs to make sure that all local variations are complied with. You need to book in advance and get an approval to ship dangerous goods before arranging for a pickup. If you don’t take approval for dangerous goods in advance, the pickup will be denied by DHL. Some of the common products that come under dangerous goods include food flavoring substances, perfumes, electronic products, lithium batteries and other chemical substances. If you are selling any of these kind of products on your WooCommerce store, it is a good idea to check if any of those come under restricted category. If your products are in fact not restricted, you might have to declare them as “Not Restricted”. 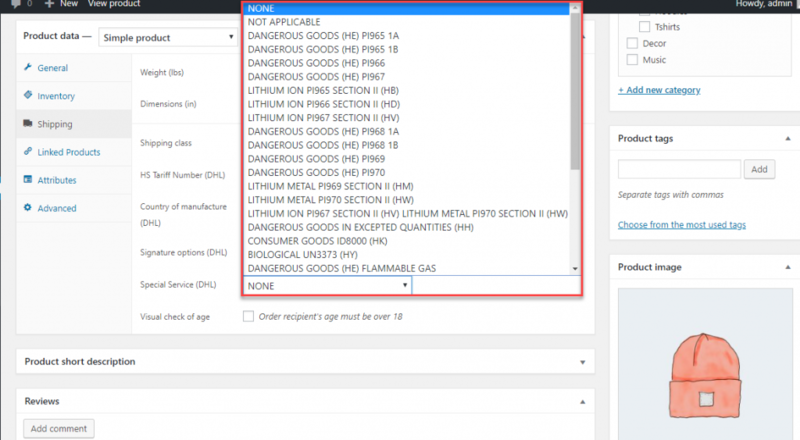 How to ship dangerous goods while using ELEX WooCommerce DHL Plugin? 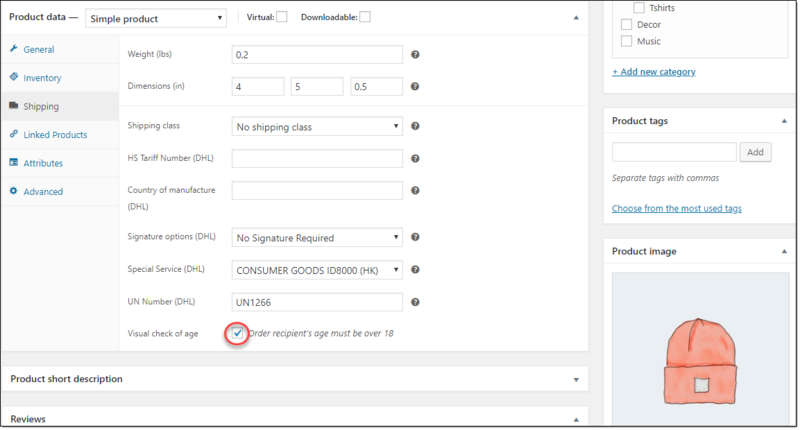 When you install ELEX WooCommerce DHL Plugin, a set of custom fields are added at individual product level, which will help you with the process of shipping dangerous goods. 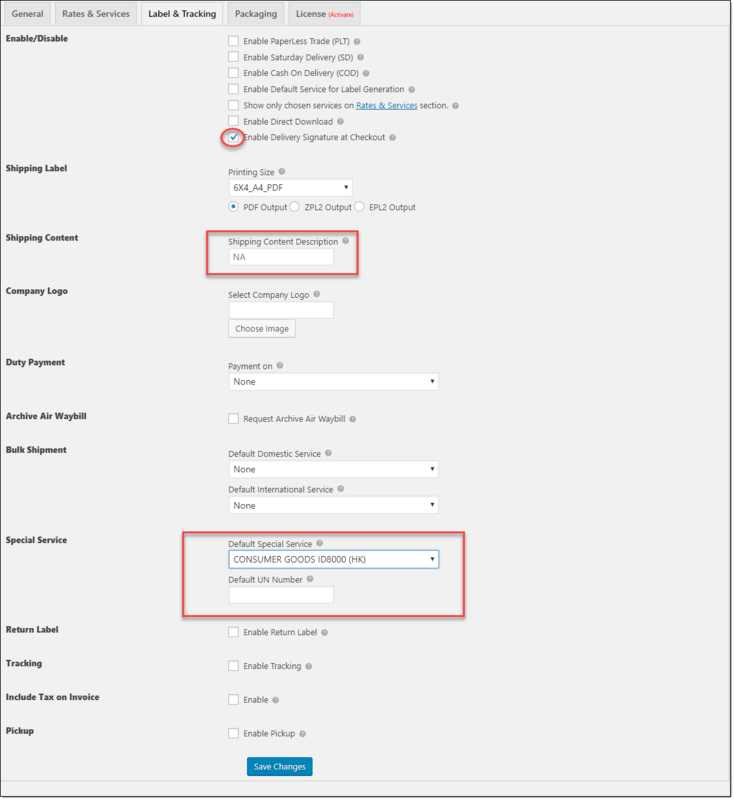 ELEX WooCommerce DHL plugin offers an option to choose one from a range of services, at the product level. If you are trying to ship products that are not classified under special services, you can enter a customs description to be placed on the shipping label. You can also create an option at the product level to make ‘Adult signature’ mandatory to be able to receive a package containing dangerous goods. On the product page, you can also enter the UN number of the product in the designated field. UN Numbers are particular numbers assigned to hazardous materials for transport by United Nations Committee of Experts on the Transport of Dangerous Goods. UN Numbers range from UN 0004 to about UN 3534. For non-hazardous materials, there is no UN number, and you can leave this field blank. 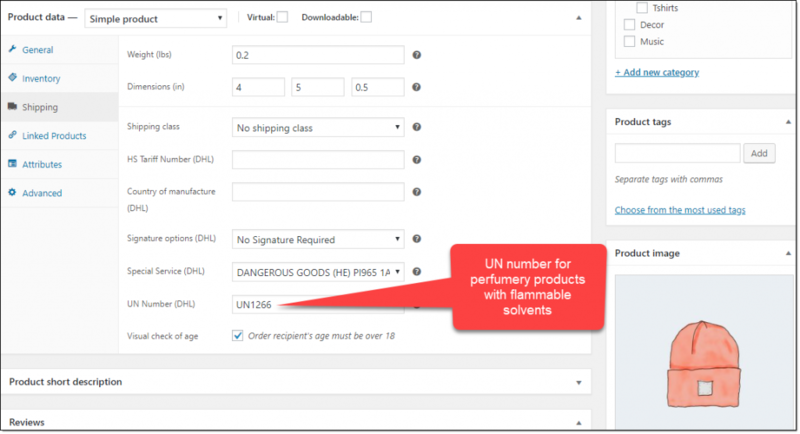 For example, if you are shipping perfumery products with flammable solvents, you have to enter its UN number, which UN 1266. The plugin also creates a custom box where you can choose an option for visual check of age. If you check this option for this product, a shipment containing that product will be delivered only to a person whose age is over 18. On the Label and Tracking settings too you will find a set of options to help you with the smooth transport of dangerous goods. 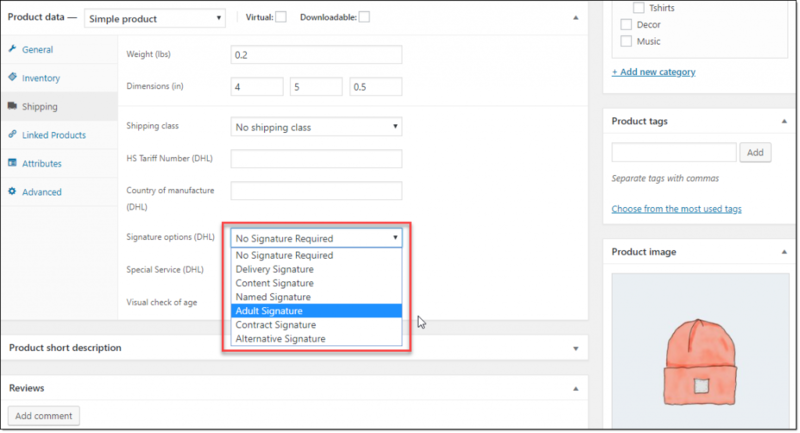 These include the option for customers to enable Delivery Signature while checking out. Also, there is an option to enter a Customs description of your product, which will be displayed on the label. 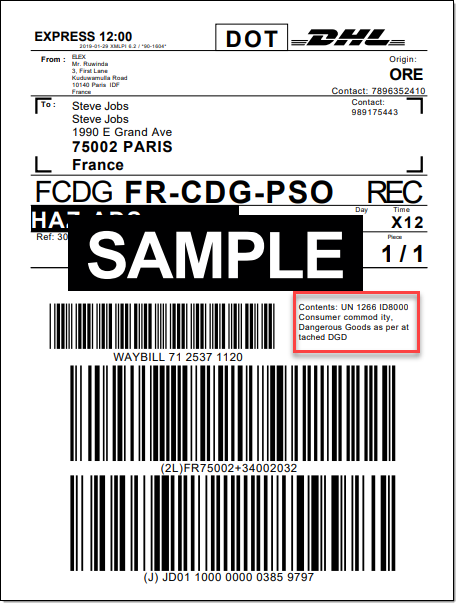 You can also Enable a default special service for your shipping labels, if most of the products you ship are coming under dangerous goods. How the label for dangerous goods will be different? Based on the settings you have enabled, the label you print will include information about dangerous goods as per the compliance requirements. DHL follows international guidelines when it comes to shipping dangerous good hazardous materials include perfumery products. If you are selling products that can be classified as dangerous, you need to take the advice of an expert. DHL customer support will provide you the required advice on handling dangerous products or hazardous material. You can understand more about the ELEX WooCommerce DHL plugin from the documentation. In case of queries, please contact our customer support.